Usage analytics is a set of data that gives you an overview and breakdown of your team's viewing history and usage. Usage analytics is also in real-time and will show instant data upon refresh. To get started, log in to your Pluralsight account and click on Analytics using the left pane navigation. Next, click on Usage from the top center panel. Alternatively, this report is accessible from your main dashboard landing page under Overall Usage. 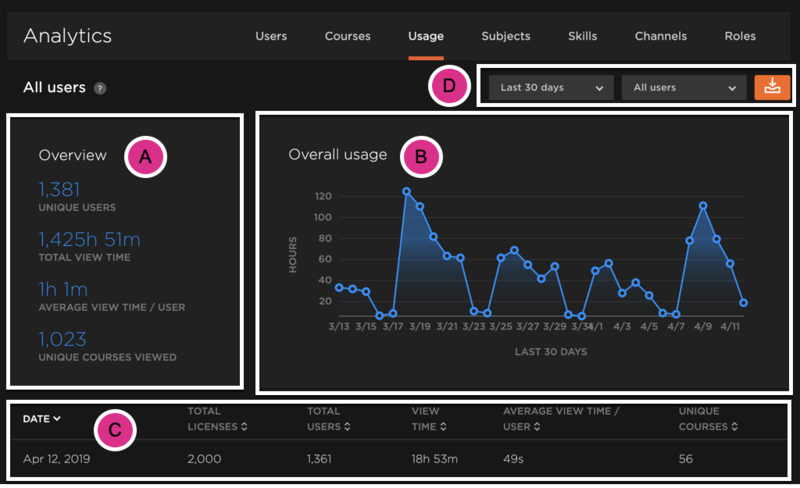 A: The overview section gives you an at-a-glance view of your teams overall usage. You can find how many unique users have taken content as well as the totals and average view time of course videos. B: The overall usage graph shows you the daily, weekly, or monthly usage trends. This gives you valuable insight into peak and low times in which your team is engaging with content. Highlighting a particular point will give you view time totals for that time stamp. C: This set of data works as a supplement with the usage graph above. Where the graph works as a visual to your teams' usage, the the granular data set helps you see more clearly the way your team trends in regards to using and taking content. Tip: You can use the time frame toggle at the top to change the view and data intervals. Last 30 days will give you a daily view, last 90 days will give you a weekly view, and last 12 months and all-time will give you a monthly view. D: The report download can be filtered to pull data within a 30 day, 90 day, 12 months, or all-time timeframe. If you have multiple teams on your group, you can always filter between those. You can learn more about the report download below. The report download gives a breakdown of your teams' usage trends and totals. Question: How long does it take for usage analytics to show on a report? Usage analytics is in real time! Typically, it can take a just a few seconds to update. Question: What users are included in the report? Any individual that has ever been in your group will be shown in the analytics data. This includes removed individuals. Question: Someone on my plan shows 100% completion of a course but the view time doesn't match. How can that be? The person on your team could have clicked through the course which will show completion but a small viewing time. They could've watched the courses at a faster speed. The could've re-watched portions of the course. They could've watched the course on another group plan then completed on the new group plan. Now that you've learned about usage analytics, check out one of our other Getting Started articles to get the most out of analytics for your team.